Build Value... To sell the vehicle. Close The Sale... Get a firm commitment to own it now. Negotiate A Win / Win... Hold more gross profit. Our goal in this class is simple: develop professionals in sales. To do that, we teach my very deliberate, very effective and proven process salespeople can follow every time, with every type of buyer - that will take them from the Greeting all the way to the delivery. Our focus is on developing high achievers in sales by teaching them the core principles of selling - and by developing the skills they need to leave class and start selling more units the rest of their career. We all know that our business and our buyer changed dramatically in the last 2 years. The days of casual purchasing are over and today's prospect is more cautious than ever. Today's prospect on your lot is also more ready and more able to buy today, than in the past. There is some 'Rocket Science' to selling more units and to maximizing the gross, but learning to sell more by giving your prospects what they want and what they expect isn't 'Rocket Science' - it's just common sense. We'll cover the most current facts about today's customer; their wants, needs and what they tell us are critical to you making the sale. How many more sales would you make if you could get a firm commitment to purchase on 6 out of every 10 prospects you talk to on the lot? Exactly, you'd more than double your sales and triple your income, virtually overnight. 71% of the people who left without buying, said they found a vehicle they would have purchased. Almost all of those sales were lost because the salesperson hadn't mastered a simple process that would take them from the greeting, straight to the sale. With no clear process to follow, 90% of the salespeople put the logic (price - trade - down - payments) ahead of the excitement and value of owning the product. And they miss easy sales every day. When you and your salespeople leave class, you'll walk out the door with an effective, repeatable process you can follow with every type of prospect, on every type of vehicle, at any price level - and you'll have the skills you need to turn your prospects into deliveries in under 2 hours, 57% of the time. 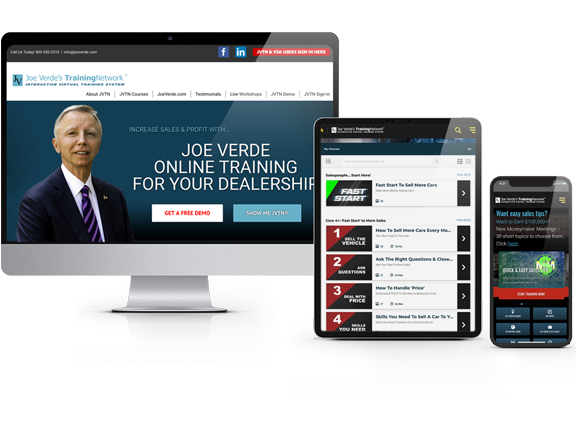 Value is the first thing to go when dealerships and salespeople get busy or desperate for more sales. Value is the first thing out the door on a busy weekend. It's "hurry up there are people everywhere" - pre-qualify on trade, down and payment - then close on price. And if objections come up, which they're guaranteed, to because no value was created - salespeople try to drop the price even more to get a commitment today. Value has all but disappeared in today's tougher market, too, as dealers, managers and salespeople become more desperate for a sale. What everyone has forgotten though, is that the value salespeople create, determines whether the vehicle is worth whatever price you're asking. To sell more to today's customer, it's critical to understand that price doesn't determine value - it's just the opposite: Value determines the price they're willing to pay. There is so much we aren't taught when we get into sales, and not understanding how to be effective in each of these three areas will also cost your salespeople units and income every day. Most salespeople do try to do a good job and do care about their customers, and most sales are missed by just a few words - not by a few dollars. We will teach you and your salespeople exactly how to control the selling process so they can follow those steps to the sale. Closing is a process, not a question, and we'll teach your salespeople a simple and effective closing process. We'll also teach them how to handle all of the most common objections you get in today's market, with today's buyer so they can close more sales today. We recommend everyone attend this course. You'll master the critical skills you need in sales, and quickly double your units and income! 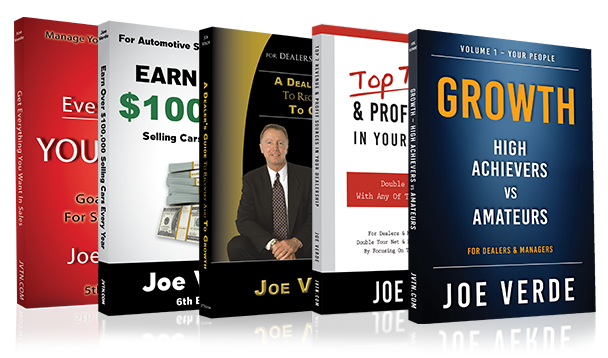 Contact Us for a special consultation of Joe's Sales Workshop. Joe - we haven't met, but you've had a profound effect on my life and my career. I started off as a ‘great average salesperson' selling 5-6 cars a month, but after going to all your Sales Workshops and reading your books, I'm now making over $100,000 a year! I close 17-20 units every month, and I've become a gross holding, upwardly professional salesperson. Knowledge is power, and I learned so much in your class. When I get objections, I acknowledge them and then Clarify, Rephrase, Isolate and Close (CRIC) and just keep going. It's so easy now - I go to work to work, plan my day, set goals and I'm making it all happen. Thank you Joe, and all of your staff for helping me gain the skills and confidence I needed in sales! 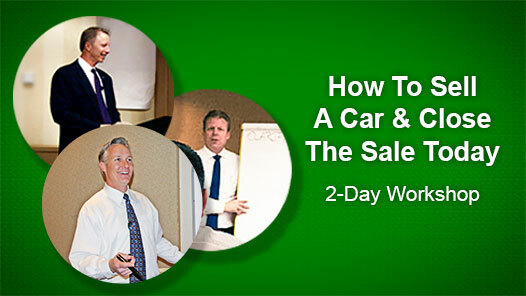 Joe, I was averaging 12 cars a month before your How To Sell A Car Today Workshop. I loved the class and really focused on getting better at closing the sale and on getting more yeses (minor commitments / benefit confirmations) from my customers and it worked. I sold 20.5 the first month after the workshop, my confidence was way up and making those sales was never easier. Now my current 90-day average is 16.5 and my commissions are up an extra $75 per unit, too, and the best part - my customers love me! Joe, thanks for a great workshop and a nice boost to my units, income, and my CSI. WANT TO BOOST YOUR SALES & PAYCHECK OVERNIGHT? See an immediate improvement in unit sales and gross profit as you build confidence, develop more selling skills and make more money. We can help - call, email or send us a message below today!